Start a new Ferrari California question. 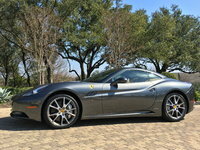 What Do You Think Of The 2009 Ferrari California? how to get a ferrari in india..what about duties and taxes? Ferrari's 2009 California will mark a number of important and surprising firsts for perhaps the world's most highly regarded and successful exotic car manufacturer. It features Ferrari's first front-engine V8, first hard-top convertible, and first 7-speed dual clutch transmission. Rumored to have begun life as a Maserati and become a Ferrari as a result of its escalating production costs, the California aims to be a true sports car that can also serve as a daily driver, even for people who refuse to be bothered by a manual transmission. The California's 4.3-liter, 453-hp V8 displays a Ferrari badge, but is the same as the one under the hood of Alfa Romeo's gorgeous new 8C Competizione. That engine produces 357 lb-ft of torque and can propel the California from 0 to 60 in less than 4 seconds, with a top speed of 193 mph. The relatively few folks who have driven it so far have been impressed with the transmission's speed and smoothness as well as the feel of the car on the road. Featuring Ferrari's mannettino to adjust the suspension's tightness and Formula One-proven traction control, the California isn't ready for track time, but it certainly provides plenty of thrills for drivers and jealous observers. Ferrari plans to build 2,500 Californias per year, almost 50% of its existing production capacity in Maranello, so had to build a new factory for the new model. And despite its cost of just about $200,000, the first two years' worth of production are already sold out. Molto bello!